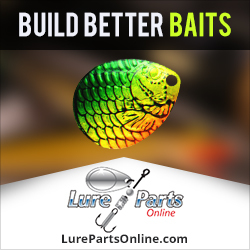 If you want to learn How to Pour Two Color Soft Plastic Baits, you’ve found the right place! A lot of anglers have learned how to make their own soft plastic baits, but without some experienced guidance it’s not always easy to learn How to Pour Two Color Soft Plastic Baits. At the end of this article is a great video that will walk you through the steps. In the meantime, here is some info to lead into that video and get you prepared to pour your own two color soft plastics baits. One of the great things about pouring your own soft plastic baits is that you can make the custom colors that you know will work for you. This also allows you to experiment with new colors and test them on your local lake. You can do an endless amount of testing and tweaking in order to figure out what works best for you under any conditions you encounter. For many, using a two color bait is critical to getting bites. Pouring a single color is super easy. But learning How to Pour Two Color Soft Plastic Baits can be a bit intimidating. By the time you finish this article and the video below, you’ll no longer be intimidated, and you’ll know what it takes to know How to Pour Two Color Soft Plastic Baits. The secret to making it as easy as possible is in using the dual injector. 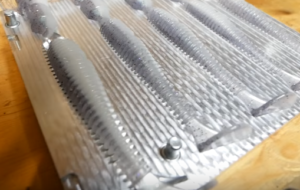 This tool will make creating two-color baits incredibly easy and painless. The dual injector is used with a blending block that allows two colors of soft plastic to be injected into your mold at the same time. This saves a ton of work and makes the process very easy! The hardest part, which isn’t very hard at all, will be choosing the two colors that you want to work with! And as we mentioned above, you can experiment and tweak to your heart’s content until you get the colors just right. If you enjoyed this post, please be sure to like it and share it with your friends. If you’d like to learn more about how to make soft plastic swimbaits, click here. This entry was posted in Making Soft Plastic Lures and tagged How to Inject Two Color Soft Plastic Baits, How to Make Two Color Soft Plastic Baits, How to Pour Two Color Soft Plastic Baits, Making Two Color Soft Plastic Baits, Making Two Color Soft Plastic Baits Tutorial on July 25, 2018 by Lure Parts Online.